Dance Studio Life, a magazine with a back-to-basics approach, whose mission is to be at the forefront of dance and education by promoting the highest possible standards in teaching. Dance Studio Life understands the soul of the teaching field and seeks to engage the passion of our readers with thought provoking and informative content along with awe-inspiring photography. Whether in print or online, a subscription to Dance Studio Life delivers high quality dance education content to you, in the palms of your hands, ten months a year. From innovative business tips and programs to in-depth features on cutting edge dance educators across the country and world, Dance Studio Life keeps you informed and engaged to the benefit of you and your school. Did you miss out on an issue or wish you could remember that awesome program you read about months ago? The Dance Studio Life archives go back over ten years with many of our features, columns and editorials still available online. Check out the content that has made Dance Studio Life the industry leader in dance education for the past thirteen years and for many years to come. The Dance Studio Life monthly e-zine is a great way to get relevant news and features on the world of dance education. 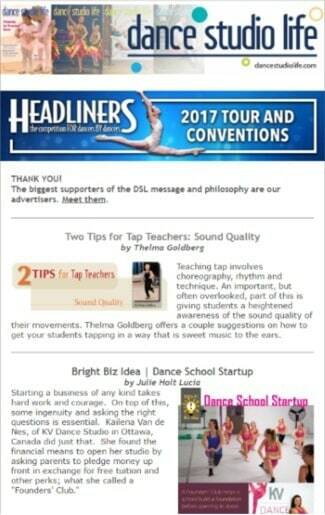 Read articles and get informative tips from the latest and past issues and stay connected to our advertisers who offer high quality dance related products. Everything you need to be informed is at the tips of your fingers each month!